Matt Toner: Biba is re-inventing the playground experience using not much more than the smartphone already found in every caregiver’s pocketbook or purse. Our apps leverage kids’ love of touchscreens in order to get them off the couch and back outside for imaginative, inclusive, physical, and digital play. It’s a healthy second screen option that has attracted the interest of iconic, family-friendly brands like Hotel Transylvania and the Teletubbies. Currently, we have fitted more than 3,800 playground sites around the world with Biba’s smart playground system. We also send out monthly data insights to the 1,000+ communities that host these sites, places as far-flung as Santiago, Singapore, St. Louis and St. John’s. As a result, we were just named by Fast Company magazine as one of the Most Innovative Companies in the world. 1/ From a gaming perspective, digital transformation is evolving at lightning speed. Pokemon Go put location-based, AR-infused mobile games on the map and there are more innovations coming. It’s an exciting place for us to be. 2/ On the other hand, digital transformation for the traditional playground has been almost non-existent to date. In some ways, they have been the last bastion of a non-digital experience. if you look at a photo of a playground from 100 years ago and one from last week, there are few significant differences. But that’s changing because kids are changing, so we’re in the right place at the right time. 3/ Somewhere between the two is the smart city movement. Over the past few years, there is an increasing imperative for cities to become data-centric and this is beginning to impact their operations in a profound way. Our gameplay produces actionable insights around playground usage, which can be crucial in making key planning decisions around recreational expenditures. Matt Toner: We’ve all read the research which shows children are sacrificing outdoor play time for screen time, and we also know from personal experience just how difficult it can be to enforce any kind of parental control over touchscreen devices. Biba is an elegant way to “judo” that fixation into active, outdoor co-play with parents. We are also aware that this approach to family time might not be for everyone, but for those families struggling to find a healthy balance, our mobile games and Biba-enabled playgrounds make it a little easier. Matt Toner: The technology products used most at Biba are through our game development and tech teams. We conduct a lot of our work with Adobe Creative Cloud, Honeybadger, Honeycomb, Unity, Fork, Jenkins, and Visual Studio Code. For general office operations, we are fans of Google GSuite for email and drive services, Harvest for web-based time tracking, and of course Slack for team communication and collaboration. 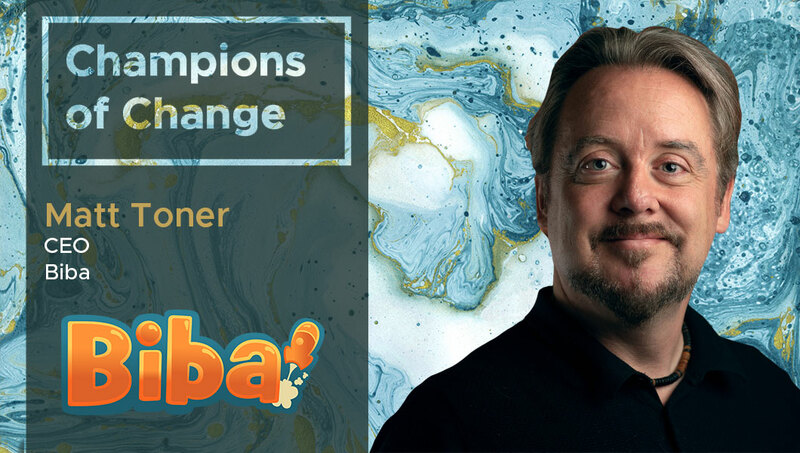 Matt Toner: Because of the business we are in, getting started with a Biba app is as simple as taking the smartphone every parent has out of their pockets or purses, searching Biba, and downloading our app. As soon as that is done, users are ready to go. Our apps are available for all platforms and makes/models of smartphone and are free-to-play. Matt Toner: We are a pretty paperless organization, and we do have a love of whiteboards. Matt Toner: Our primary focus will always be to keep enhancing family play experiences in public play spaces. We aim to provide children and caretakers a healthy way to engage with screens while getting outside and active, playing together. Biba will also focus on the opportunity our data brings to smart cities strategies. Our data offers new insights around what happens on a city’s playground – insights that can help defend budgets, direct funds for maintenance and inform critical decisions around playground upgrades and public event organization. Matt Toner: We stay connected to the local tech, AR/VR and startup markets, particularly in Vancouver through various associations, events and publications in the space. Vancouver is a hotbed for tech and there are a lot of innovative solutions coming from here. We learn through our community. The National Recreation and Parks Association is also a great resource for our team as the go-to outlet for what we need to know in the playground industry. Matt Toner: For business, Twitter. It’s where everyone in the tech world hangs out and it’s a great place for us to connect with our app and playground users. Twitter cuts through the noise that seems to be clogging Facebook these days.